UCAT preparation programs give UCAT candidates an extra edge. The METC Institute UCAT Comprehensive Program and UCAT High Achiever Program are designed for students looking to outperform the cohort, and score over the 95th percentile. The UCAT Comprehensive Program combines all UCAT workshops offered by the METC Institute to provide candidates with an all-inclusive study approach for the UCAT exam. The Program combines workshops in verbal reasoning, decision making, quantitative reasoning, abstract reasoning, and situational judgement to maximise student performance. 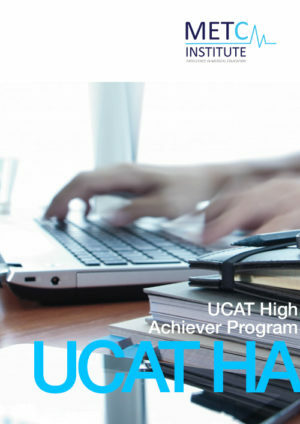 The UCAT High Achiever Program provides candidates with access to all UCAT workshops along with access to a personal UCAT tutor and additional medical school interview preparation. Candidates are personally guided through their UCAT and medical school interview journeys via their personal tutor. The UCAT High Achiever Program is without peer, and is the most comprehensive UCAT preparation program available. All METC Institute UCAT preparation courses and programs offer students access to tutors where assistance is required. 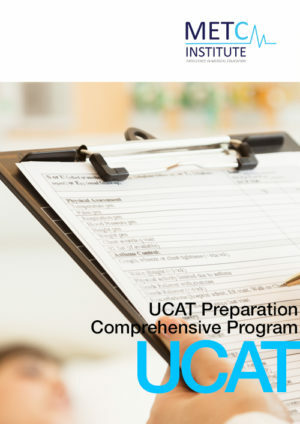 The UCAT High Achiever Program is a personalised program offering UCAT candidates intensive UCAT preparation along with a medical interview preparation. The Program is not simply a UCAT preparation program – it offers students a complete solution to all of the hurdles faced in entering undergraduate medical, dental, and clinical science programs. Each UCAT High Achiever is paired with a personal UCAT tutor who guides the student through their exam preparation, medical school application, and medical school interview. The Program is the undergraduate extension of the family of METC Institute High Achiever Programs offered to promising students currently in medical and post-graduate medical specialist training programs. The UCAT Preparation Comprehensive Program is a formal UCAT preparation program which combines all METC Institute UCAT workshops in order to maximise candidate performance in the UCAT. The program consists of five UCAT workshops (total of 10hrs of live tutoring) each corresponding to a specific section of the UCAT exam. By enrolling in the UCAT Comprehensive Program, candidates learn advanced skills in verbal reasoning, decision making, quantitative reasoning, abstract reasoning, and situational judgement. Workshops are delivered via the METC Institute online classroom by a member of the METC Institute Academic Faculty. Students are also provided with unlimited online access to a METC Institute UCAT tutor.